Want to start hunting your own wild game for food? One of the easiest and tastiest ways is with doves. We shot opening day of the season last week to show you how. Dove hunting is one of the oldest shooting sport traditions enjoyed in this country. Each fall, thousands of hunters take their children, friends and families out into the fields and together bag a tasty dinner. Here in California, for instance, the daily limit for mourning and white wing doves is 15 per-person. Eurasian doves — an invasive species — can be hunted year-round and you can take as many of those as you want. So, by going dove hunting, you’re helping to ensure a thriving future for the birds while also netting yourself one of the tastiest and easiest-to-prepare game birds there is. 11 percent of all hunting-related items you purchase — shotguns, shells, etc — goes directly to wildlife conservation through the Pittman-Robertson act. Step one to get started hunting is obviously to get yourself a hunting license. To do that, you’ll need to take a one-day Hunter Education course, which typically costs about $35 and is actually very fun and informative. Then, you’ll need to pick up a shotgun and learn to shoot it. Earlier this year, my girlfriend’s dad gifted us two exceptionally nice shotguns from his personal collection. The Rizzini x Abercrombie is choked in an ideal improved/modified cylinder arrangement for dove hunting, so I did most of my shooting on that, but also made a point of bagging a couple birds on his old SKB Model 400 choked modified/full, which is more applicable to bigger game that’s further away, but I wanted to bag a couple of birds with it to make him proud, so I did just that, too. In both, I used #7.5 shot with a light, 1oz load. Dove hunting involves high volume shooting, so you want a shell you can shoot for a solid couple hours without fatigue. Last year, my friend Scott and I attended a private land hunt down by Calexico organized by Mendel Woodland. The doves were thick and the people were friendly, so we figured we’d do the same this year. You can find doves on public land, but by going with an organized hunt like Mendel’s you get access to farmland where he’s invested time finding the ideal mix of trees for roosting, grain crops for food, and a water source for the doves to drink from. If you want to find your own location on your own or public land, just find those three things together and you’ll find doves. People call Scott “The Great Pink Hunter.” I’m sure you can see why. Somebody must have put the word out about Mendel’s hunts, because this year he had over a hundred guys show up, which was honestly a few too many for the property. Doves have strong eyesight and can pick out hunters in the field, so were staying clear of ours. We shot a couple birds, but just weren’t feeling very lucky, so decided to kill a day bumming around El Centro and Calexico and come back that evening, when we’d have the fields to ourselves. After a trip to the shopping mall, a tour of the border, a long lunch and a movie, we came back to the farm, found a good drainage ditch to hide in and proceeded to limit out. As you can see from my getup, you don’t need camo to go dove hunting, but it does help. Even more effective is finding cover to breakup your silhouette. I sat my camp chair down in a deep hole by a drain, surrounded by saplings and was able to pick off the birds while seated. This year we also brought a Mojo Voodoo Dove decoy, which another hunter had sworn by last time. The idea is that it’ll encourage doves to fly close to inspect it and it does seem to bring 20 or 30 percent of passing birds a few yards closer. That should be all the help you need. Other gear that helped immensely was this cheap 5.11 shell pouch that holds a full box and allows you to reach them through an elastic port in the lid, but holds them in as you move around. My favorite new item of shooting gear, however, are these Randolph Engineering Ranger Falcon glasses. High quality optics are just as important for your eyewear as they are for scopes and binoculars, giving you a clearer, more contrasting picture that allows you to acquire targets earlier and more successfully track them throughout their flight. These fit comfortably, provide an uninterrupted field of view and protect your eyes from hot gas and debris. I was finally able to master a shot that’s been troubling me as I’ve gotten more serious about shotguns. I can hit targets flying towards me, targets flying away from me and even targets moving diagonally, but stuff flying straight across has really been a challenge. Doves travel at up to 55mph and are wary little creatures, so hunting them is about the best shooting practice you’ll get. It’s important to recover the birds as you shoot them; they’re easily lost in tall grass and brush. Mark their position as they fall and then walk straight to them without being distracted by any other tasks or averting your gaze. I loaded the birds into my ARB chest freezer in the trunk of Scott’s car as I shot them. That runs off a standard 12v automotive outlet and, in contrast to a cooler full of ice, keeps the birds dry to better preserve them. You owe it to any animal you kill to use it as well as possible, so ensuring the meat would survive the trip home was of utmost importance to us. We wrapped up shooting by about 7:30 and made the three hour trip home, by which point we were exhausted and the doves were frozen solid. I plugged the ARB freezer into my 110v outlet at home to keep them frozen overnight, then set about cleaning them the next day. I won’t run pictures here to avoid offending people, but you can find plenty of instructional videos online that’ll show you how to breast them. I did it while they were still frozen, so a thin, flexible knife was handy for slicing the breast away from the rest of the body. I use LL Bean’s Wingshooter’s Field Kit for all my dressing at home or in the field. It’s easily carried with you in its sheath and something about carrying scissors on your belt just feels extra badass. It only takes about 30 seconds a bird to get the breasts out, I then like to rinse them under a cold tap to get feathers and any remaining organs or blood off, pat them dry with a paper towel and throw them in the refrigerator until it’s time to cook. Before doing that, use that same LL Bean knife to slice the meat away from the breast bone. Again, that’s super quick and easy; not much different than cleaning a fish. Last year, Lara cooked the breasts in port and cream, French-style, but I wanted to do it this year and opted for the tried-and-true redneck recipe — bacon and Italian dressing. Buy the good, nitrate-free bacon from Whole Foods as well as the organic balsamic Italian dressing. Game meat is the healthiest you can eat, so there’s no point ruining it with nasty preservatives and cheap ingredients. 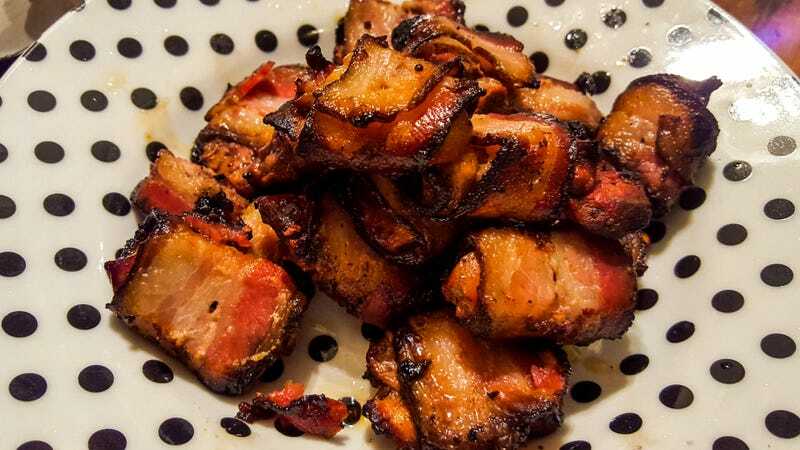 Cut the strips of bacon in half and then wrap each breast half in one and slide them onto a kebab skewer. Once that was done, I laid them in a dish and dumped the dressing onto them, allowing it to sit for about 20 minutes while I got the Big Green Egg up to 500 degrees. 10 minutes a side was about right to get the bacon crispy. Each bird yields, on average, about 1oz of meat. So, with the bacon, one hunter’s bag limit will feed two people. They go well with wine, I opened a bottle of local Pinot Noir to go with the fresh, ethically sourced and healthy dinner I shot, cleaned and cooked myself. Try it some time, it’s a good feeling.